TPG Architecture has developed an office space for Chicago-based communications firm Golin. Other than a few enclosed conference rooms, every workspace, meeting space and social space is completely open. Even the executives sit in an open “way,” separated by a non-permanent furniture solution. 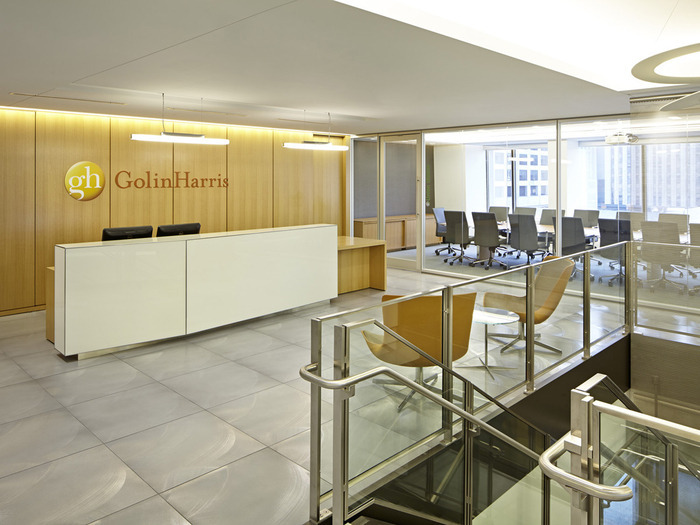 This was a particularly bold move for Golin (formerly known as GolinHarris), which has traditionally been a very conservative firm. Senior management wanted to step out of the old mold, to use the new office design to encourage collaboration and creativity. The client’s position was “We know how it should work, but not what it will look like.” TPG helped them visualize how people work, how they interact with each other and how the space and information flows, and this analysis was the basis for the new office plan. Golin coined the term “PREVOLVE” to describe their readiness for the future. After 55 years of business, the agency completely redesigned its service platform to combine strategy, creativity and engagement into one seamless package that is delivered to clients – big and small. The Chicago office needed not only to embody this mission but enable the workforce to meet its goals and function in a practical way. We have aligned the workplace with the people, processes and technology in a way that helps our client win in a complex, connected society. The office breaks away from traditional silos. Seniority-based hierarchy is replaced with communities of dedicated specialists who are embedded in each account. MEP/FP/IT Engineers: Environmental Systems Design, Inc.
Code Consultant / Permit Expeditor: Burnham Nationwide, Inc.
General Contractor: Interior Construction Group, Inc.